On New York Avenue in Oak Bluffs, there is a special place. The Community Solar Greenhouse began over 25 years ago. Most people know it as the place to buy heirloom tomato plants. Every February the members gear up for a seedling sale which takes place in May? We sell hanging baskets for Mom as well as tomatoes such as Brandywine, Black Prince and Sungold. What makes it special you might ask. There are community garden plots at the Farm Institute. Whipporwill Farm has a CSA. Many Island farms have a bounty of homegrown produce. The most important and wonderful philosophy of Comsog is that it is cooperative. Garden plots are not the sole responsibility of an individual but a cooperative endeavor. How many times have you left your garden in the summer and come back to a tangle of weeds or worse a dried out, sad, sun baked crust of soil with only a few brave soldiers left. Think about this! You can take your vacation and eat vegetables too. Someone will water and plant and weed in your absence. The next wonderful idea about this lovely, green, sun filled place is that, it is a place to learn from each other and share ideas. It is a place to experiment and play and enjoy the miracle of life, without having to invest in your own cold frame or greenhouse. Comsog has fund raisers throughout the year to support itself. You may have attended one of the popular concerts of David Crohan at the Whaling Church. That has been an annual event for many years. What is happening there now? The weather is getting cold and many of the greenhouses around the Island are being put to bed, but we have many things growing. Inspired by Elliot Coleman, author of Four Season Harvest, we have an abundance of greens ready to be picked. 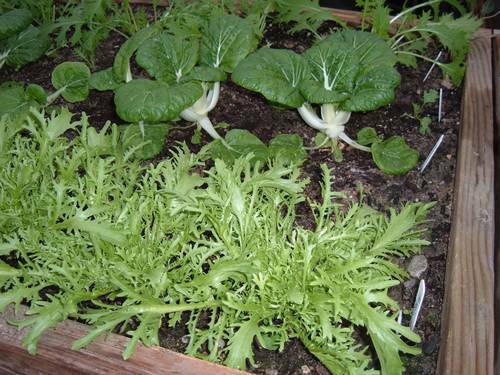 Right now ready for harvest is lettuce, mizuna, and kale. Defying all probability, we still have tomatoes and in the not too distant future we have kohlrabi, broccoli raab, swiss chard, mesclun and pakchoi. This winter we will continue starting lettuce seedlings throughout the winter about every two weeks. We have a new “Pick a head, plant a head” policy to keep the beds green all season. Another new experiment is to try to keep a lacewing population in the greenhouse all winter to control the aphids. A wonderful byproduct of this project is that we have planted nastursiums to feed the adult lacewings as well as baskets of dipladenia, streptocarpus and petunias. The result is a feast for the eyes as well as a few nasturtium flowers that can brighten a salad in the winter. 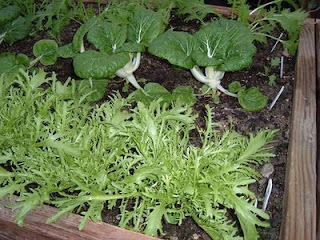 Today I planted: frisee, fennel and tatsoi. Tatsoi is up. Spinach is starting to come up. We need to plant the red romaine seedlings and more head lettuce. Rhubarb bed is cleaned up.